The population of South Australia continues to grow and its composition is changing. In the five year period between 2011 and 2016, South Australia’s population increased from 1.64 million to 1.71 million, at an average annual increase of 14,688 persons and an average growth rate of 0.9% per year. This growth varies across the state and is detailed below. Accounting for 83% of the State’s total population, the Greater Adelaide Planning Region grew by 68,437 persons from 1.36 million to 1.43 million between 2011 and 2016 at an average rate of 13,687 persons or 1.0% per year. 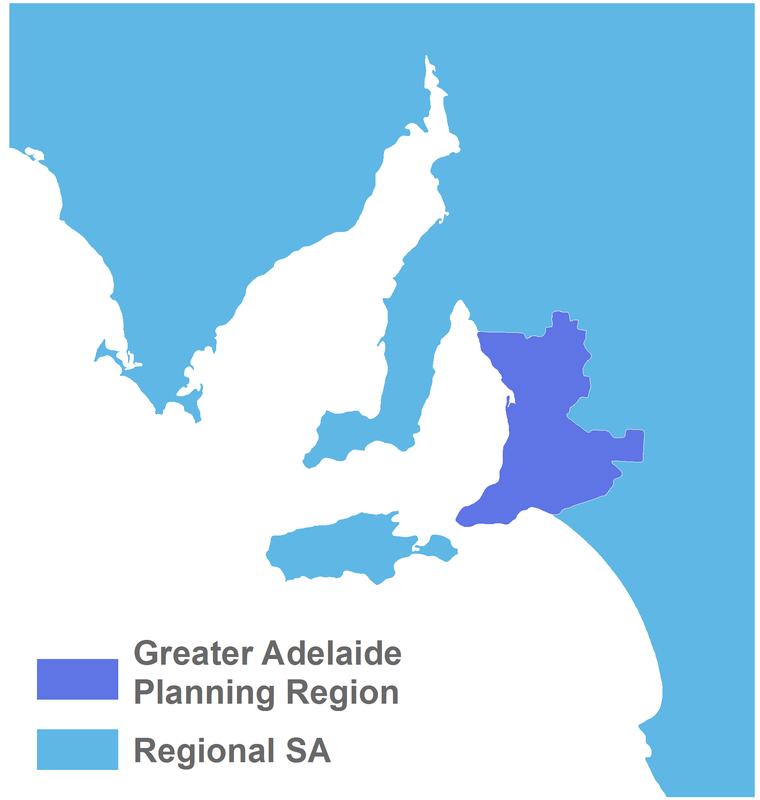 93.2% of South Australia's population growth between 2011 and 2016 occurred in the Greater Adelaide Planning Region. All Greater Adelaide Planning Region Local Government Areas (LGAs) experienced population growth during this period, with the exception of Adelaide Hills. The LGAs with the greatest growth were Playford, Salisbury, Port Adelaide Enfield and Charles Sturt with each recording increases of more than 6,000 residents. The City of Adelaide recorded an average annual growth rate of 2.3% due to the significant number of apartment developments. Regional South Australia's population increased by 5,003 persons during this period to reach 283,932 persons by 2016 and an average annual growth rate of 0.4%. At the LGA level, 15 of the 44 councils experienced population declines across Regional South Australia. Although most of the declines were small, four councils recorded losses of more than 100 persons in the five years to 2016. In 2011, South Australia’s population was 1,639,614 and by 2016 it had grown to 1,713,054 at an average annual increase of 14,688 persons and a growth rate of 0.9%. The Greater Adelaide Planning Region was the fastest growing area in the State, recording a growth rate of 1.0% per annum, which saw its population increase from 1,360,685 in 2011 to 1,429,122 in 2016. This continued growth supports the need for ongoing monitoring and strategic land use planning as outlined in the 30-Year Plan for Greater Adelaide Update. At the same time, the State’s population continues to age, with the share of South Australians aged 65 and over increasing from 16.0% (261,593) to 17.7% (303,140) during the five-year period. This is a significant increase of 41,547 persons, or 15.9%, as the post-war Baby Boomer cohort begins to enter its retirement years. Population change is driven by natural increase (births and deaths) and net migration (overseas and interstate). Over the past 5 years, net migration has contributed an average of 6,750 persons per year. The contribution made by each growth component is shown in Figure 1. Figure 2 indicates that between 2007 and 2010 large increases in net overseas migration were the major driver of increased population growth. However, recent declines in net overseas migration coupled with increasing net interstate migration losses have slowed South Australia's population growth. Natural increase has remained relatively steady over the decade. * Components of population growth were not rebased according to 2016 Census results. As such they do not sum to recorded population growth. Figure 3 compares long term net overseas migration (NOM) trends in South Australia with other jurisdictions across Australia. Although South Australia received 22,033 arrivals from interstate in 2015-16, a larger number of persons departed the state resulting in a net interstate migration loss of 6,398 persons. 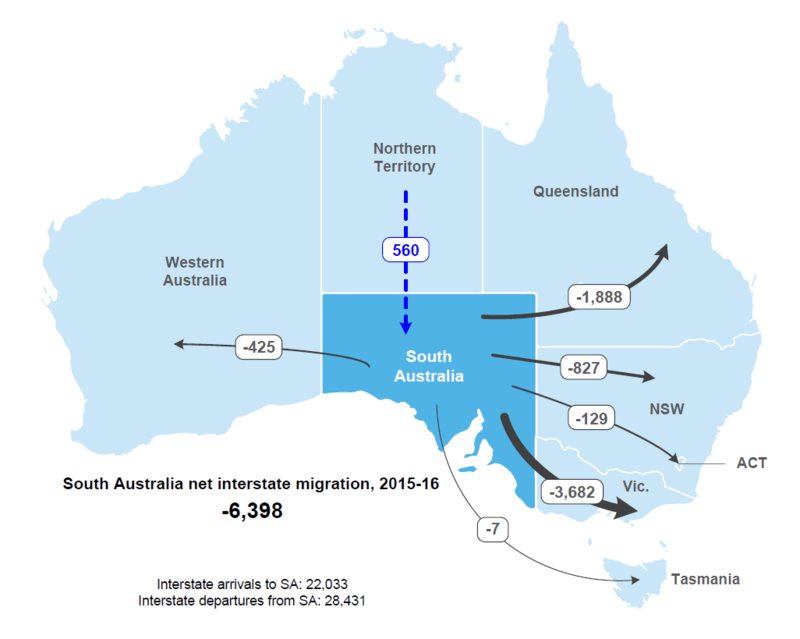 Figure 4 shows South Australia's net interstate migration flows in 2015-16. Net losses occurred to all other states and territories, with the exception of the Northern Territory. The largest net interstate migration loss was to Victoria, accounting for 57.5% (3,682) of net losses. Over the 2015-16 period South Australia experienced net interstate population losses in all age groups apart from a slight gain in those aged 70-74 years - see Figure 5. Persons aged 20-39 years accounted for 58.6% (-3,751) of losses and are likely to have moved interstate for education and employment opportunities. Over the 2011-16 period South Australia recorded a more modest average annual growth rate of 0.9%, compared to other jurisdictions in Australia with the exception of Tasmania - see Figure 6. In view of this, South Australia's share of the nation's population has decreased from 7.3% in 2011 to 7.1% in 2016. Victoria and the Australian Capital Territory have enjoyed the nation's highest growth rates over the last five years. The three most populous states of Victoria, New South Wales and Queensland accounted for 82% (1,534,276 persons) of Australia's population growth between 2011 and 2016, compared to 3.9% for South Australia. Between 2011 and 2016 South Australia’s population increased by 73,440 persons, 93.2% of whom (or 68,437 persons) resided within the Greater Adelaide Planning Region - see Figure 7. Greater Adelaide's annual growth rate over the period was 1.0%. In comparison, Regional South Australia increased its population by 5,003 persons from 278,929 in 2011 to 283,932 in 2016 equating to an average annual growth rate of 0.4%. Between 2011 and 2016 Playford, Salisbury, Port Adelaide Enfield and Charles Sturt LGAs experienced the greatest increase in population, with each gaining more than 6,000 residents - see Figure 8. These LGAs accounted for 46% of Greater Adelaide Planning Region's population growth over the five years. The middle ring metropolitan LGAs of Charles Sturt and Marion each experienced absolute population increases of 6,000 and 5,000 persons largely due to residential infill development. Significant population increases were also recorded in the City of Adelaide, West Torrens and Onkaparinga. The outer metropolitan LGAs of Mount Barker, Alexandrina and Gawler also experienced significant population increases due to greenfield housing developments. The City of Adelaide recorded an average annual growth rate of 2.3% over the five years due to the significant number of apartment developments. The fringe LGAs of Yankalilla, Playford, Mount Barker and Gawler all recorded growth rates of greater than 2.0%. There were significant disparities in Regional South Australia LGA population change - see Figure 9. 28 LGAs experienced population growth, compared to 16 with no population growth or declines. Copper Coast LGA which contains the towns of Wallaroo, Kadina and Moonta recorded the greatest increase in population at 1,320 persons which is likely to be due to their attractiveness as a place to retire. The next largest increase was in Mount Gambier which experienced an increase of 1,220 persons. At 2.5% Lower Eyre Peninsula which contains the population centres of Cummins and Coffin Bay had the highest annual average growth rate. Much of this growth has been in Boston, which is located to north of Port Lincoln. Unincorporated SA which covers land outside council areas including much of outback South Australia recorded the greatest population decline between 2011 and 2016 - 889 persons. Table 1 contains 2011 and 2016 population data for each South Australian LGA and links to infographics summarising population change for the LGA. Each field in the table can be sorted by clicking on the field heading. In line with the national trend, South Australia's population is ageing due to low fertility, increasing life expectancy and the transition of the large baby boomer cohort (persons born 1946-1965) into the older age groups. The ageing of South Australia's population is illustrated by the change in distribution of the population by age group over the 30 year period to 2016 in Figure 10. In 2016 there were proportionally less persons in each five-year age group up to 35-39 years of age compared to 30 years ago. The younger age groups (0-14 years) and working-age population (15-64 years) decreased in overall share of the population over the 30 years, while the proportion of the population aged 65 years or older (elderly) increased significantly from 11.7% in 1986 to 17.7% - see Figure 11. In terms of actual increase in population the working-age population experienced the greatest increase (184,058), while in percentage terms the elderly population increased by 87.8%. Another measure of South Australia's changing age structure is the increase in median age. South Australia's median age in 1986 was 32 years compared to 40 years by 2016.2 The ageing of South Australia's population has slowed in part due to net overseas migration gains in younger age groups.